Graphite and Acrylic on paper and plastic, Cut Photographs printed on paper, transparency and vinyl, with Property marker flagging. 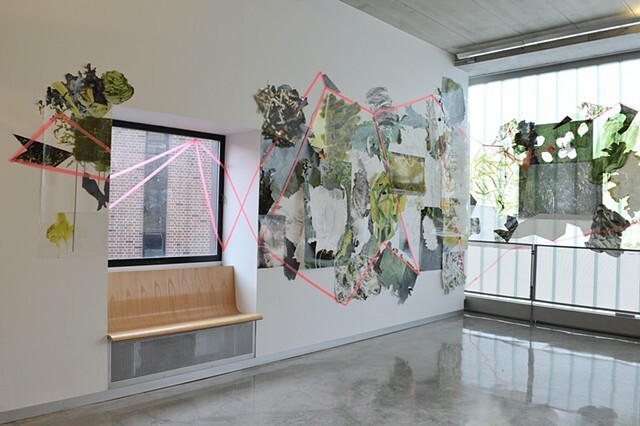 The exhibition Residuals at the University of Minnesota Architecture & Landscape Architecture Library includes Edgewilds (2017), 20 x 12 ft. wall-drawing, as well as ten archival inkjet prints from the Prairie Constructs series and three collaborative "floating landscapes" combining cut photographs, drawings, cast plaster and plants. All the images are either photographs or drawings of the urban prairie that links together St.Paul and Minneapolis, running along the University of Minnesota transit way, a major rail yard, and the Kasota Ponds/Bridal Veil Watershed.